Save money on every gallon for your company vehicles! Managing company vehicles can be expensive and time-consuming. Stripes card solutions for business can make your life easier and your business stronger. 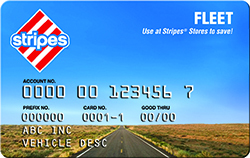 Whether you’re looking for a fuel card program with robust rebates or nationwide acceptance, Stripes has the fleet card for you. Enroll Now! • Save on every gallon of fuel at over 650 Stripes® Stores in TX – plus over 5,000 Sunoco locations in the U.S.! Fuel cost savings, convenience, broad acceptance and the powerful controls of a Stripes Fleet Card – a winning combination for your business! 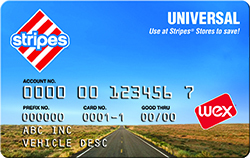 *On regular and/or diesel fuel purchased at Stripes® Stores and at Stripes locations with the Stripes Fleet Card or the Stripes Universal Fleet Card. Rebates are subject to change at any time without prior notice.